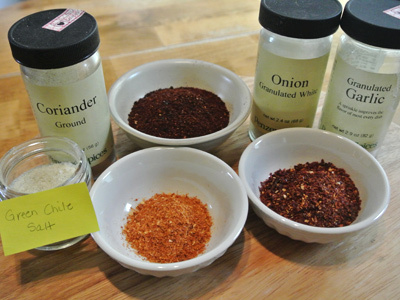 For the spice rub I ground 3 different kinds of chiles. A spice/coffee grinder makes the job easy, (use the grinder only for spice or only for coffee, the two don’t mix). These are the Guajillo chiles and I also ground some Ancho chiles and Chile de Arbol. So here is the final rub ingredients. Ground Ancho, Guajillo and Chile de Arbol chiles, coriander, onion powder, garlic powder and green chile salt. 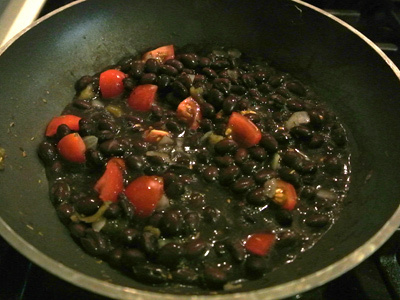 I seasoned the black beans with some freshly cut tomatoes, green chile, onion and epizote. Salt to taste. Let them simmer on the stove for 5 – 10 minutes. Then set aside. 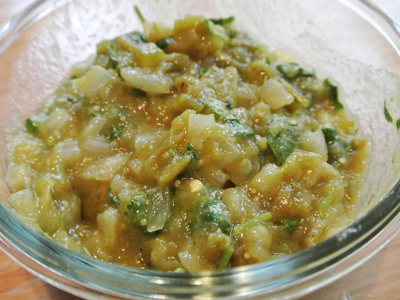 I made some salsa verde with mostly roasted Hatch green chiles, some tomatillos, onion, garlic, cilantro, lime juice and salt to taste. I did not blend this batch, just left it chunky. 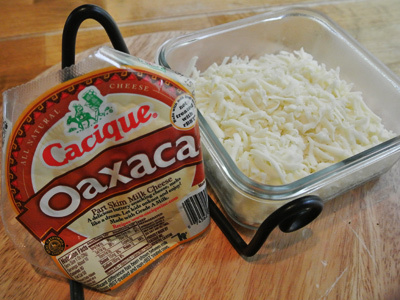 Oaxaca cheese is my favorite but a Monterey Jack cheese will work as well. Toppings made! 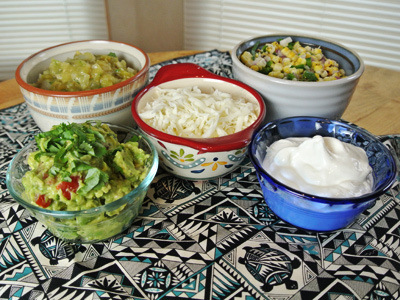 We’ve got some fresh guacamole, salsa verde, roasted corn salsa, Oaxaca cheese and some sour cream. Heat the grill to smoking hot. 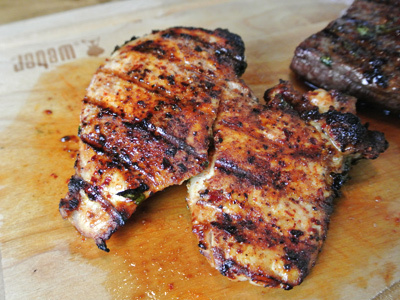 Sprinkle the spice rub generously on both sides of the chicken and steak. Add some roughly chopped cilantro and drizzle with olive oil. 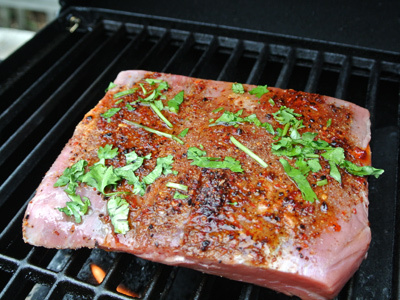 Place on a hot grill for anywhere from 6 – 9 minutes on each side depending on how hot the grill is. You want the chicken to be cooked at least 165 degrees internally to be safe. The flank steak will go for about 5 – 6 minutes on each side. For medium rare steak a temp of 130 – 135 degrees will do. When the steak comes off the grill let it rest for a few minutes before slicing. That will give the chicken a few extra minutes on the grill. Chicken is done . . .
Steak has rested for about 5 minutes and ready to slice. Cook rice according to package directions. If you want, add the juice of 1/2 lime, some roughly chopped cilantro and salt to taste. 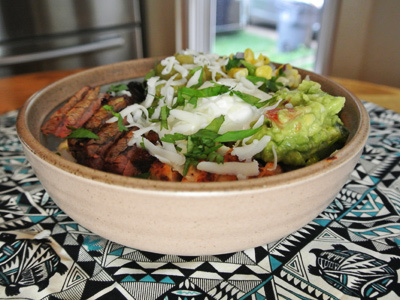 Scoop as much rice as you like on the bottom of the bowl, then layer with some seasoned black beans, salsa verde, roasted corn salsa, fresh guacamole, sour cream, grilled steak and/or chicken and grated Oaxaca cheese. Heat a gas or charcoal grill to smoking hot. 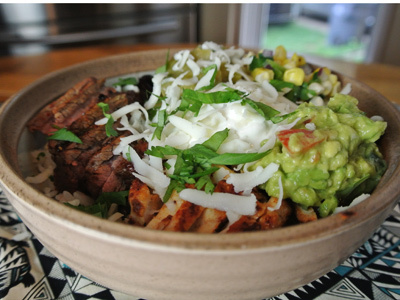 Generously sprinkle burrito rub over both sides of chicken and steak. Sprinkle with chopped cilantro and drizzle with olive oil. 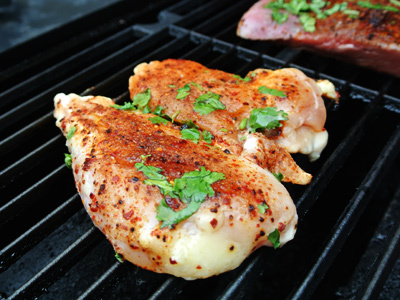 Grill chicken for 6 – 9 minutes on each side, depending on how hot your grill is. 165 degrees internally is safe for chicken. 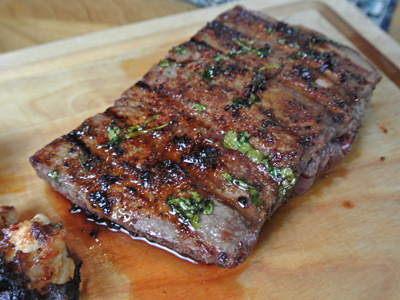 Grill flank steak 5 – 6 minutes on each side or 3 – 4 minutes for a skirt steak. Let steak rest for a few minutes until the chicken is cooked through. Slice vertically on a slant. Cook rice according to package directions. Add the juice of 1/2 lime, roughly chopped cilantro and salt to taste if desired. 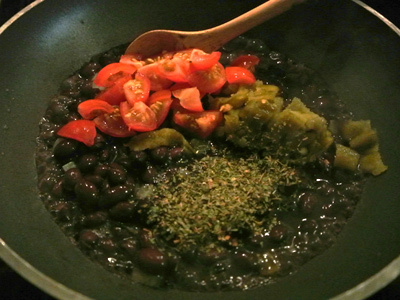 Heat 1 can of black beans in a medium sized pot over medium heat. If you would like to season them, add 2 – 3 tablespoons of sauteed onion, 1 roasted green chile that has been peeled and seeded, 4 – 5 cherry tomatoes that have been roughly chopped and 1 teaspoon dried Epizote. Salt to taste. Simmer beans over medium low heat for 5 minutes. 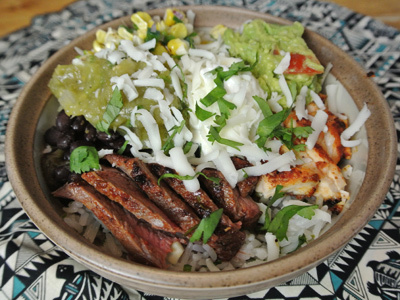 Layer 3 – 4 bowls with rice on the bottom, then top with black beans, grilled chicken and/or steak, roasted corn salsa, salsa verde, sour cream and grated Oaxaca cheese. Sprinkle roughly chopped cilantro over top if desired. Combine all spices together. Any unused rub can be stored in a plastic zip lock bag for later use. Roast the tomatillos, green chile, onion and garlic under the highest setting of the broiler or roast the veggies on a grill. Drizzle with olive oil and broil or grill approximately 15 minutes, turning often to roast on all sides (drizzle the garlic in olive oil and wrap in some aluminum foil to roast). 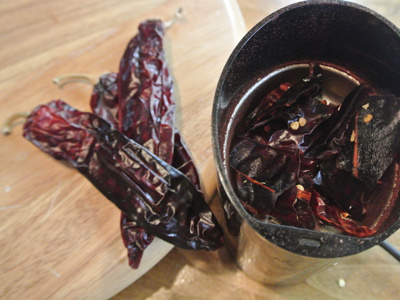 Place chiles in a plastic bag to sweat it out for an additional 15 – 20 minutes. Peel the chiles, seed and remove stems. Peel the tomatillos, they will be very juicy when roasted. Chop the roasted chiles, tomatillos and onion. Peel the roasted garlic and smash with a fork. Mix in with the veggies and add the juice of 1/2 lime and cilantro. Salt to taste. If the salsa verde is too thick, add a little bit of water, a tablespoon at a time until you have the desired consistency.